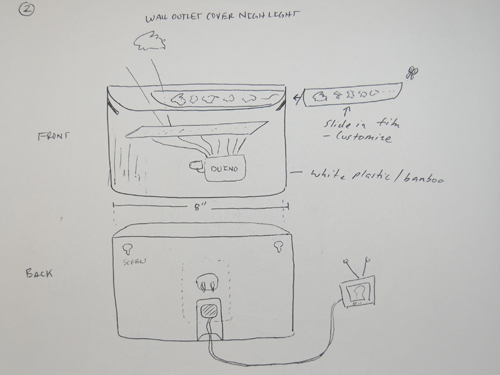 PROTOTYPE 1: This prototype is an organic looking light that I hope replicates the aesthetic of the ocean. The user will turn the LEDs on and off using a switch. 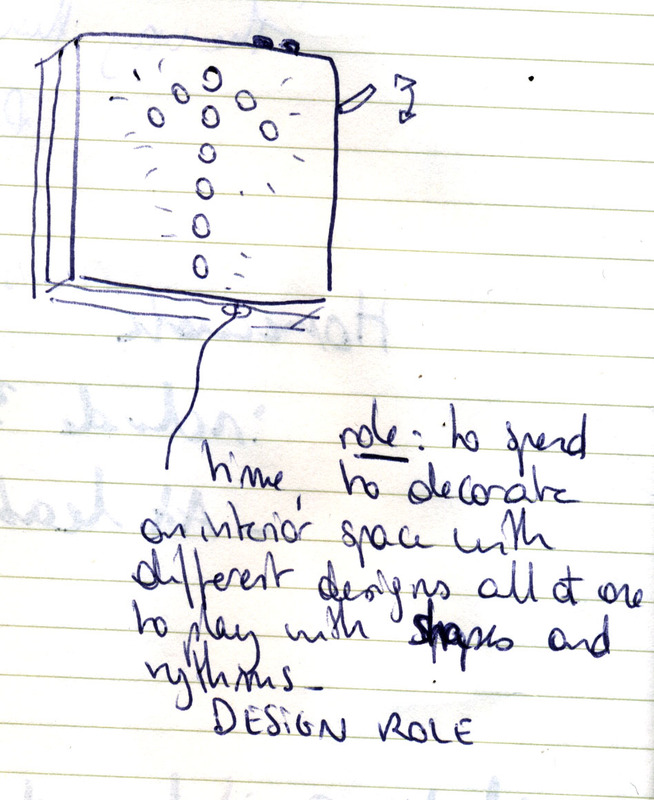 The passage of time in this prototype will be seen by the display of lights and the patterns they make. 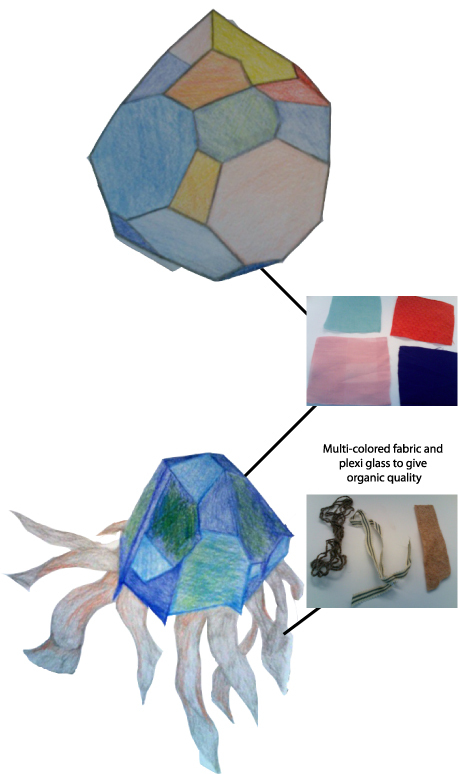 The organic looking quality could be achieved by using different types of fabric in the construction of the shell. Varying the exterior of the shell will give a different effect depending on where the light is shining though. PROTOTYPE 2: This prototype is more organic looking and could either sit on a table or be hung from the ceiling. I feel that my second prototype better fits my intentions of an organic looking light. 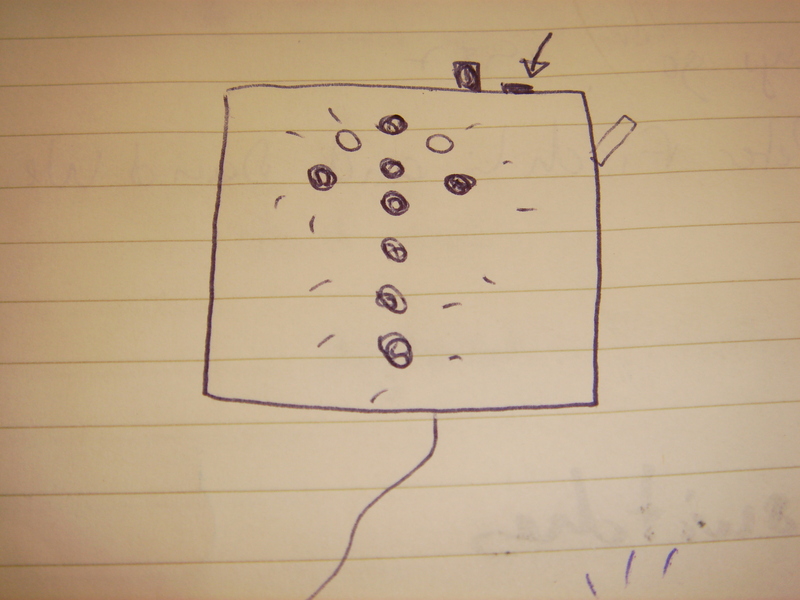 This prototype uses a turn knob which could be better suited for the user in having control over the passage of time – turn the knob to the right and the lights go faster, turn them to the left and they slow down. I was also interested in the possibility of recording the ocean and having the waves grow louder as the lights blink faster. This prototype looks similar to a jelly-fish. The "legs" would be made out of different colored string and ribbon. I see this prototype being built using fabric as well. As far as the implementation is concerned, it really depends on where this piece will be placed. 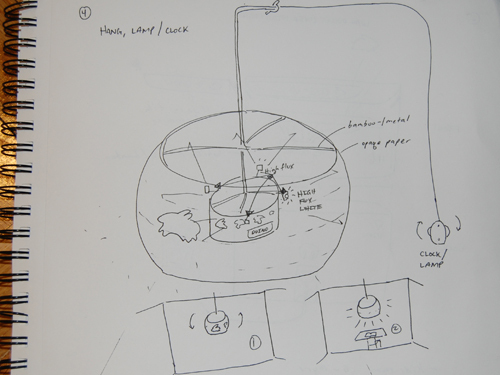 If hung from the ceiling, the LEDs would be contained within the capsule by something like a toilet-paper roll – they would need to be completely self contained. 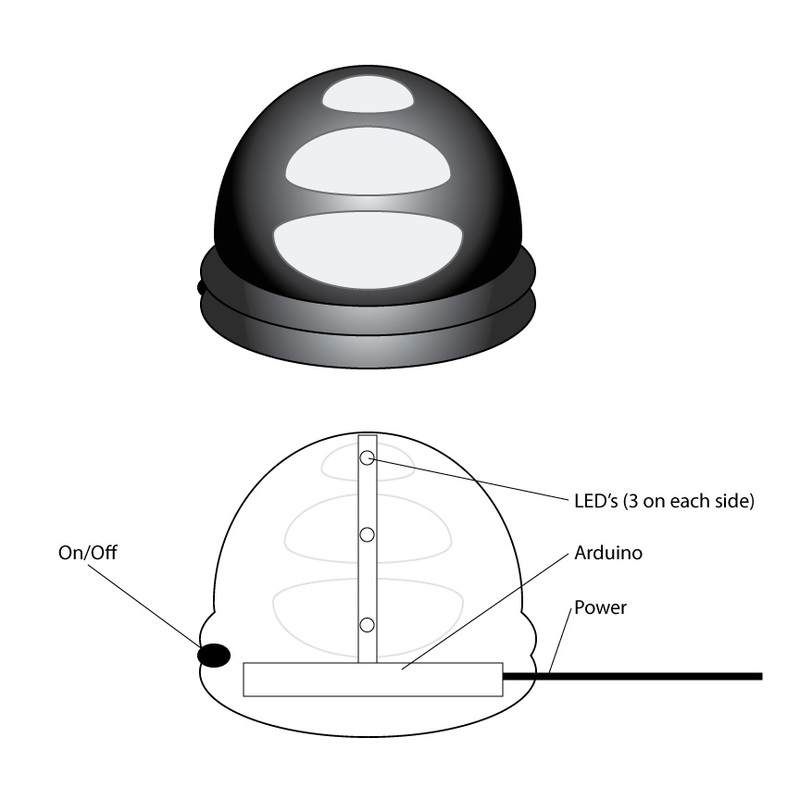 If placed on a desk or dresser, the LEDs would be placed under the capsule and will not need to be completely self contained. As far as the implementation is concerned, the second prototype would be easier to accomplish. To bring a sense of time with design pieces that imitate life, human actions. Design to be displayed on a wall. 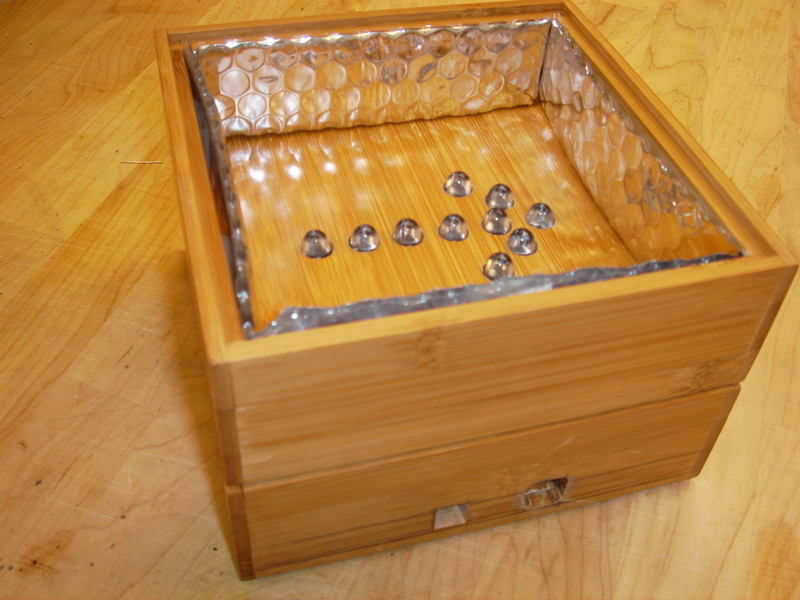 Wooden box, with mirrors on the sides to reflect the Leds. All the Leds are red. The design is easy to carry and hang by the user, and it can be opened to change a component in case of. The size is 6X6 inches, so that it discrete enough on the wall when it is not ON. It is like a frame, a painting hang on the wall. The size is small to recall a holly icon, and intrigue the viewer. Because it is always hang on one's wall, it needs to look appealing when it is on and off. 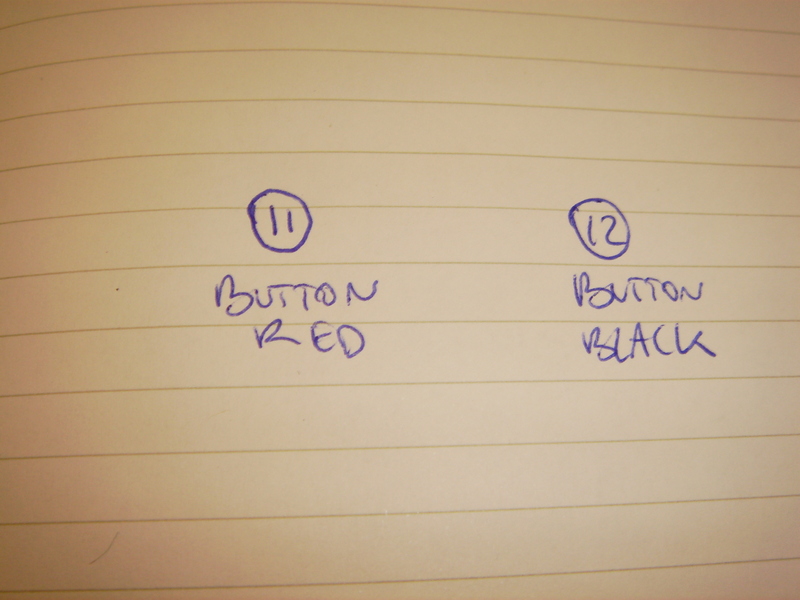 The buttons added will be the same colors than the piece: silver and red. In the box is a breadboad and an arduino board. 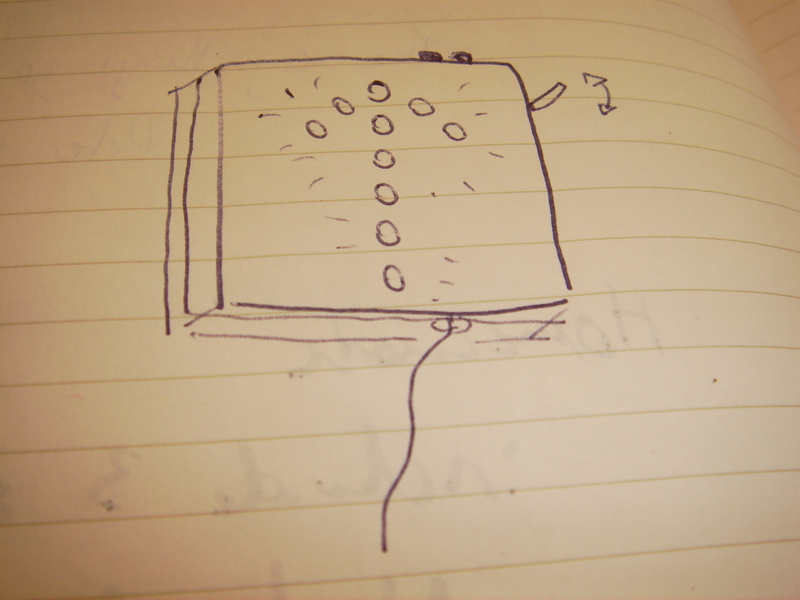 There are holes in the box for a fast programing and to plug the power in. Light, that on the opposite of the dying arrow, gives birth to the arrow by turning on all the Leds, one after the other. The candles could have a shaped of religious candles as we know them, or be at the end of their life, all melt down together to create a new form. 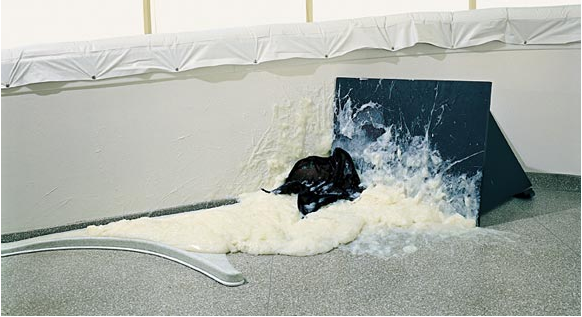 As Matthew Barney's pieces form the Cremaster cylce, the mixed media and was are to give birth in our world to a parallel world. The material are awkard and appealing. This code make the Leds fade on and off very quickly, giving an aspect of trembling candles, to create emotion and life to the candles. An ambient light that changes color to indicate the time of day and can be programmed to setup reminders. Scenario: Lawrence is a 24 year old gamer/game tester and hacker who lives in a basement apartment. Most of his time is spent in this dimly lit space play testing first person shooter games. He's also part of a guild on EverQuest and the guild has a specific time when they perform raids. Lawrence rarely keeps a track of time and would like to have a device that informs him about the time of day, in case he needs to make a quick round for groceries, etc., without the need to look at the time every so often. He also needs a way to remind him when he needs to login to the Everquest server on time, which doesn't involved setting alarms on his iPhone which he can't hear while playing a game with headphones on. Application: Ambient light is the tool for Lawrence! He can easily tell the time of day by the color of 'ambient light'. He can also program 'ambient light' to setup reminders for when he needs to log on to EverQuest or other activities. He can do all of this without being distracted from playing his game. Ambient light is dome shaped about 4 inches in diameter and about 6 inches tall. The bottom is ribbed with a black rubber finish. It has an on/off button, a USB connection and a power outlet. The dome is shiny black metallic finish and is made of plexi glass, with 3 rows of stylized 'holes' from which diffused light shines through. There are 3 columns of these holes evenly spaced across the dome. The color of the light changes over the course of the day – green for morning, orange for afternoon, blue for evening and a dimmer blue for night. 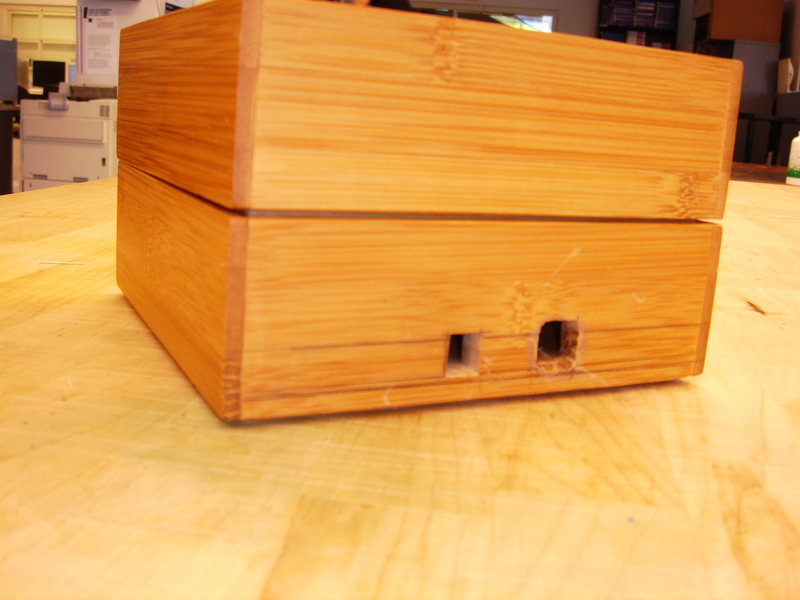 The bottom houses the Arduino which provides the USB and power connections. It also includes a small on/off pushbutton switch. From the bottom to top there is a skeleton with 6 LED's attached – 1 on either side assembled in 3 rows. The green LED's are at the top, followed by the green and the blue. The unit comes with many different programs that can be used to play different patterns by connecting it to your computer and writing to the Arduino. It also comes with a interface which can be used for configuring reminders by hooking it up to a computer. A coaster that can be use to place your drink on. Scenario: Clayton is a 27 year old guy who owns a bar in Willamsburg. He has expensive wooden tables which are getting destroyed because people don't use coasters to put their drinks on the table. This is probably owed to the fact that no one can find the coasters in a dimly lit environment or they're not motivated enough to use them. Application: Coaster is the product of choice for Clayton. They are enticing enough for people to use them and visible because they have an ambient glow. Coaster is a round and coaster sized, about 6 inches in diameter and about an inch tall. The bottom is a ribbed plexiglass while the top is flat plexiglass on which people can place their drinks. A soft glow emanates from the plexiglass which is red when 'coaster' is in use and green when not in use. These can be placed upon the tables or installed within the tables. The bottom of 'coaster' houses an Arduino, a tri-color LED and a battery pack within a second encasement. The side sports a tiny rocker switch to turn 'coaster' on/off. The top of the LED peeps out of the top of the encasement so it can light up the entire thing. The flat plexiglass piece is mounted on springs above the secondary encasement. 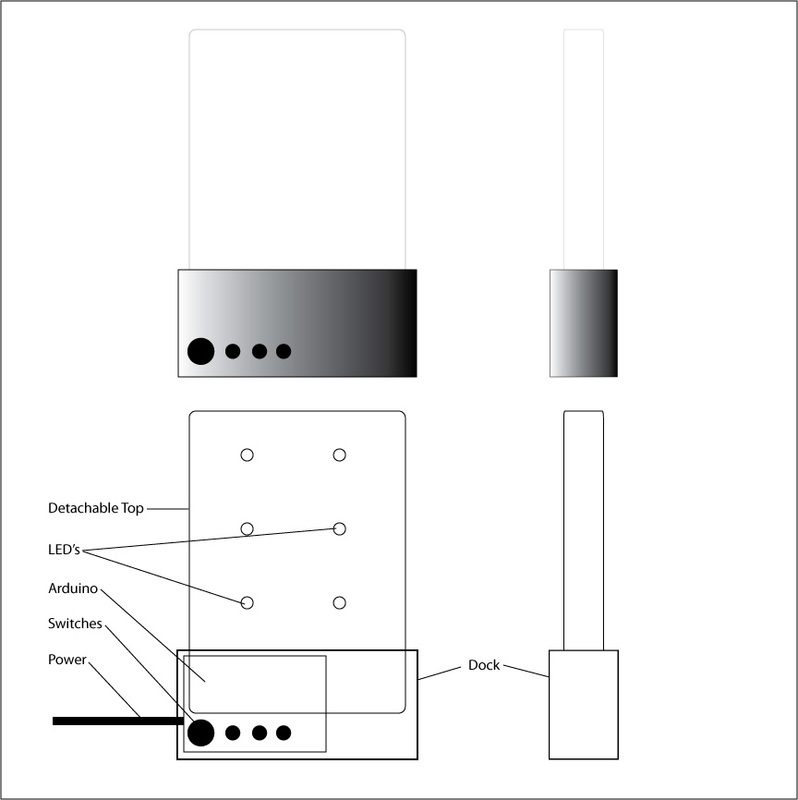 The top of the secondary encasement has a small switch which is triggered when a drink is placed on the flat plexi piece, which goes down due to the pressure.The switch triggers the change in color of the light which slowly fades to red. The opposite happens when the glass is removed. Mood Light is a portable mood light which can set the mood for any activity. Scenario: Josh is a 23 old guy engaged in tons of activities. He loves to use all kinds of gadgets and gizmos to enhance social situations, especially ones that he can carry around. Josh wishes he could carry around his lava lamp to set the mood when he's hanging out at a friends place. He also wishes his lava lamp could double up as a disco light which can be used to lively up his house parties. Application: Mood Light is the perfect toy for Josh! It allows him to set the mood of his social activity by playing different patterns for different situations. It's also small enough so he can take it with him wherever he goes. Mood Light is made up of two components – the top and the dock. The top and the dock can be detached which makes it more portable. The top is diffused plexiglass about 5 inches tall, 1 inch deep and 3 inches wide. The dock is also plexiglass but painted black with a matte finish. The dock is about 2 inches tall, 1.5 inches deep and 3.5 inches wide. The side has a power outlet and USB connection while the front is equipped with numerous tiny switches including an on/off and toggle switches for playing different patterns. 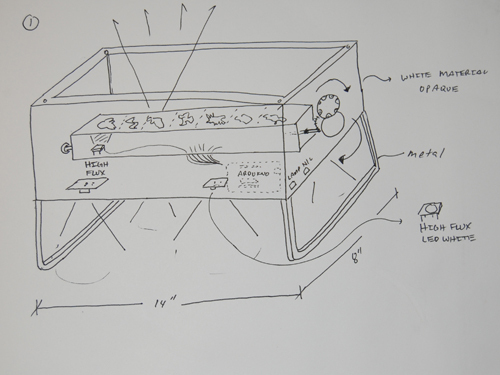 The dock houses the Arduino on one side, 4 switches on the other and possibly a battery pack on the bottom. On the top there is space for the 'top' to fit in snug and male ports which connect to the LED's. The top houses 6 LED's, 2 of each color – red, green, blue – on the bottom. Different combination of the 3 toggle switches yeild different patterns which the user can reprogram when they get bored. The LED's can possibly be mounted on a removable cartridge which can be swapped LED's in different arrangements and colors to yeild interesting results. 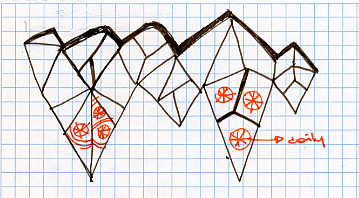 The prototype is a chandelier inspired by the shapes of crystal formation in nature. The chandelier has yellow (amber) and white lights to provide a warm light that is enough to be able to see in the room, but that is not to bright. The idea is to mimic the kind and brightness of real candle chandelier. 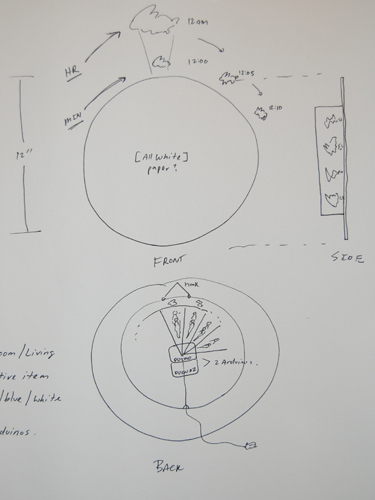 This prototype creates a light fixtures that resembles a little colony of miniature creatures. According to the time of day the colony changes the color that it emits. 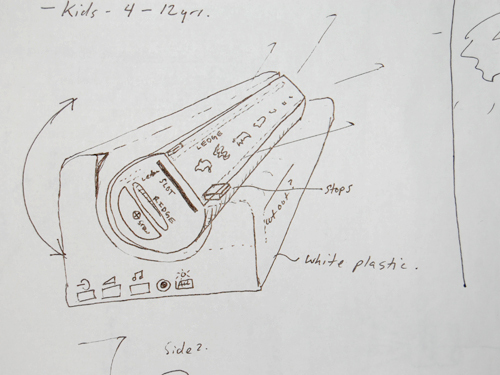 A children lamp that it tells a story with a simple animation. 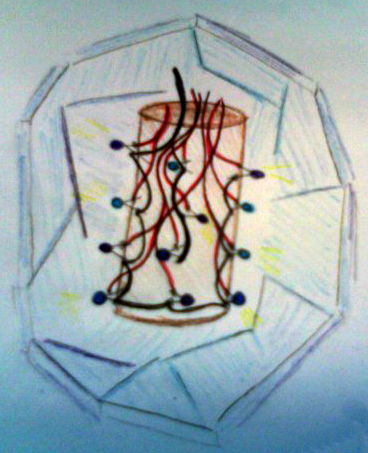 Two layers of circular paper. The layer nearest to the light source has the images of the animations. 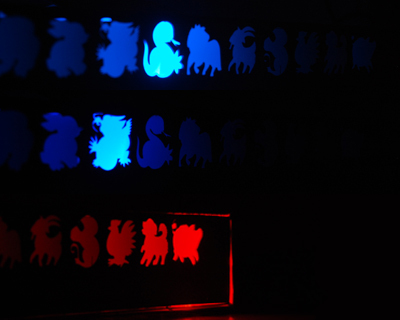 The second layer contains small vertical slits that due to persistence of vision allow a viewer to see a short animation. 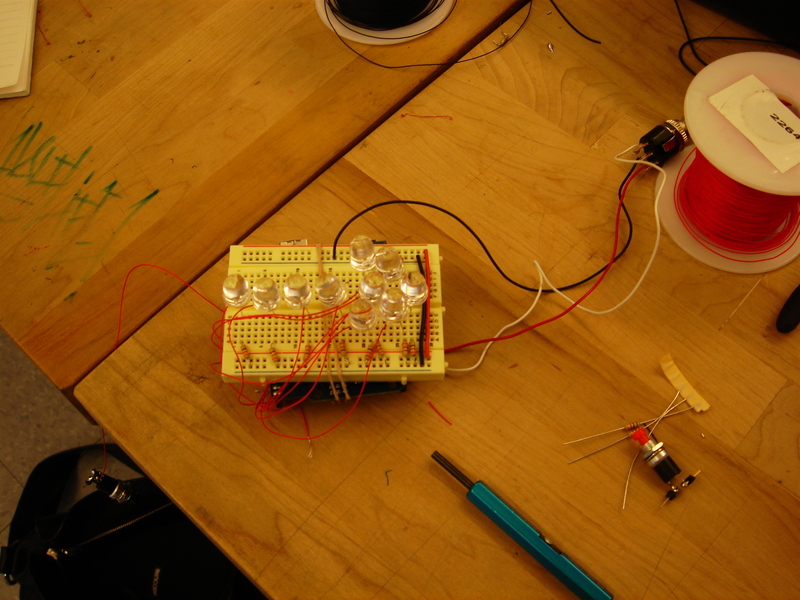 The implementation part of the miniature colony project will consist of a series of yellow (amber) and white LEDs getting brighter and dimmer through the use of PWM. 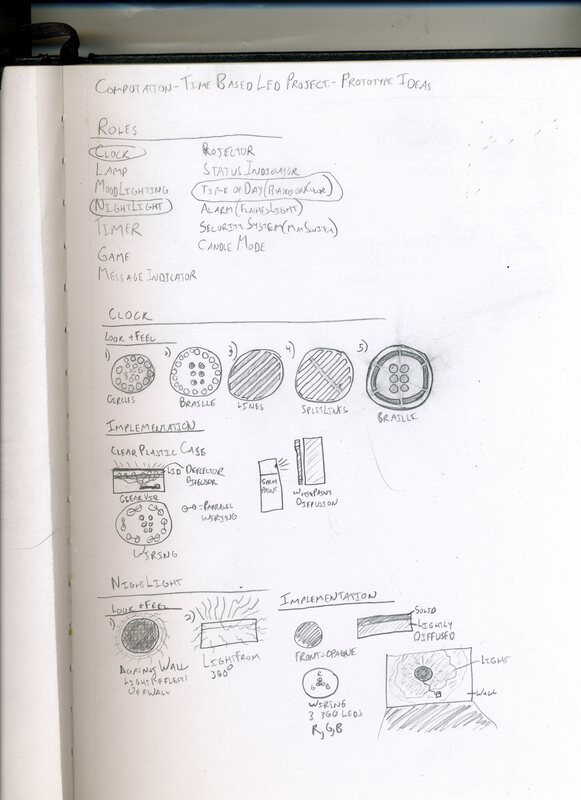 Here are my sketches for prototyping the Role, Look, and Feel of my project. 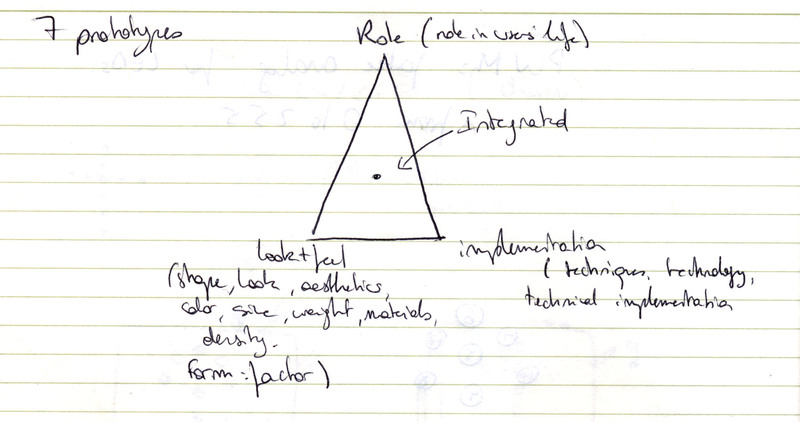 I started by trying to think of as many possible roles for the project as I could. I wish I had done this from the beginning, as I was somewhat limited by the current form factor/designs that I currently have and didn't want to get too different since the time we have left is limited. For my next iteration I will definitely start lilke this. The three roles I chose were clock, nightlight, and alarm system. I don't know yet if I want the fading to be a part of my piece, "The dying arrow", or if I want to make a new design for the fading. To test the effect, I used 3 jumbo white Leds. imitates breathing. The Leds are turned on at different progressing rythms, and they become more and more brighter. Breathing Leds from maryam aboukhater on Vimeo. 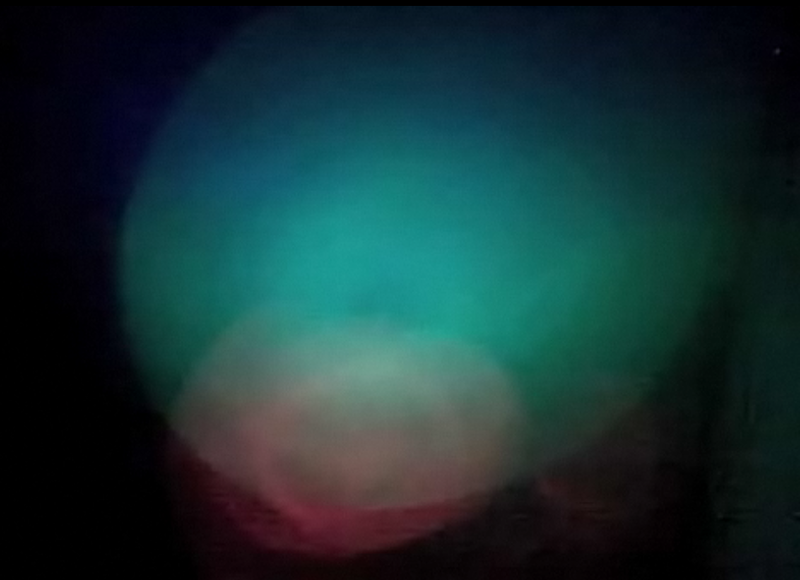 Trembling Leds from maryam aboukhater on Vimeo. The dying arrow is a wall decoration made of 10 red jumbo Leds. 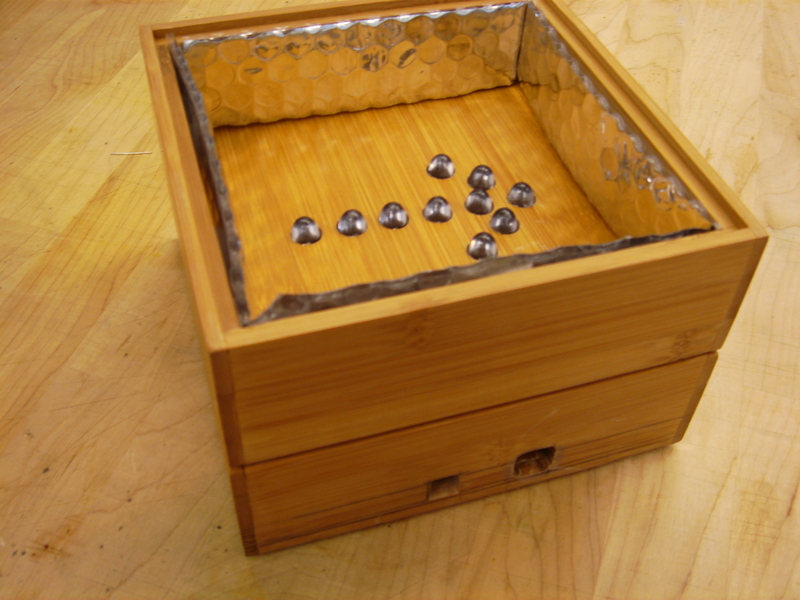 for my second prototype, the I found a wooden box where I drilled 10 holes in arrow shape, for the Leds to pass through. The breadboard I had was big enough to contain all the Leds in the arrow shape, so I just put it next to the whole to see test the effect. I did several prototypes with different wires and placements, but still, the Leds were not stable. I didn't know if it was a problem of connections or code. Being sure of the aesthetics of my box, I decided to stick the Leds to the holes. 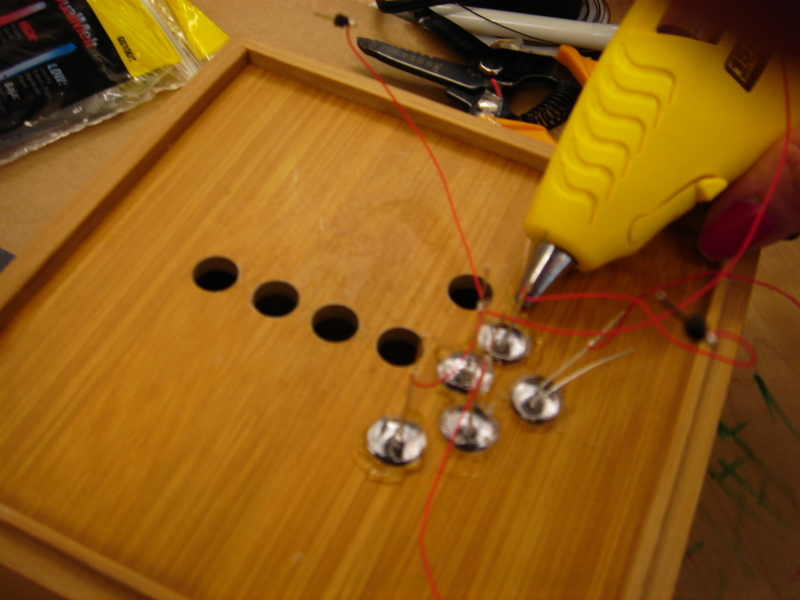 When I then connected the wires to the breadboard, I figured out that during all this time, my breadboard was broken. I replaced it orderd properly the wires and my design finally got stable. I connected a switch to turn on and off all the circuit and arduino board. My prototypes is made of two boxes: the top one with the arrow, and the second one behind it where are enclosed the breadboard and the arduino board. for a rapid programing and display. I used mirrored paper all around the sides to emphasize and reflect the red light, and to add a dramatic aspect to the piece. 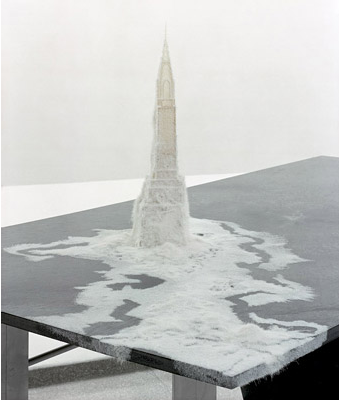 When it is one, it recalls a religious mexican iconography. The switch turn the circuit on and displays "the dying arrow". The Red pushbutton on the top displays a cross shape, turning off Leds 7 and 9. The Black pushbutton is the rebirth of the arrow. All the Leds are off and turn one to one on. The "dying arrow" displays all the Leds on, and they blink to off one after the other, at different speed. It imitates different single lives that end individually. 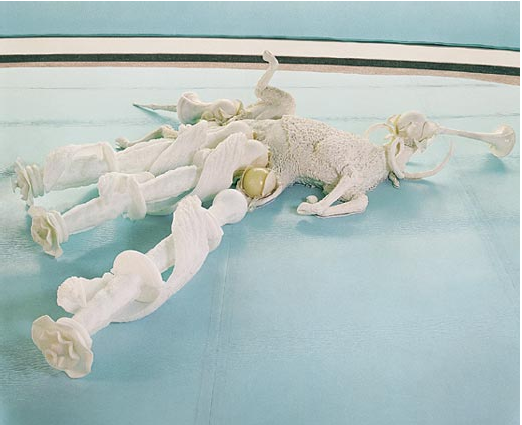 The dying arrow from maryam aboukhater on Vimeo. Here is my code, but the button don't work yet. Look/Feel – Soft feel white plastic or bamboo. Mobile unit. 12~14 inches. Rotating projector. 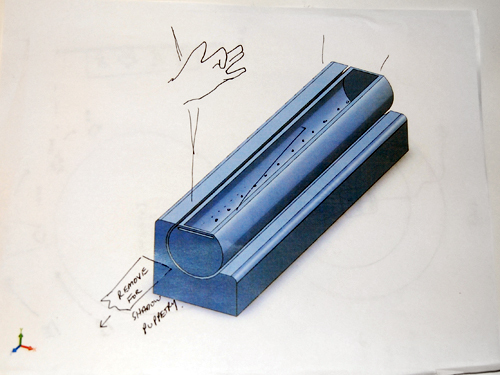 Quick solid works mock up to show basic structure. They would be ages 4~10 I would say. It can be used as home decor if so wished. 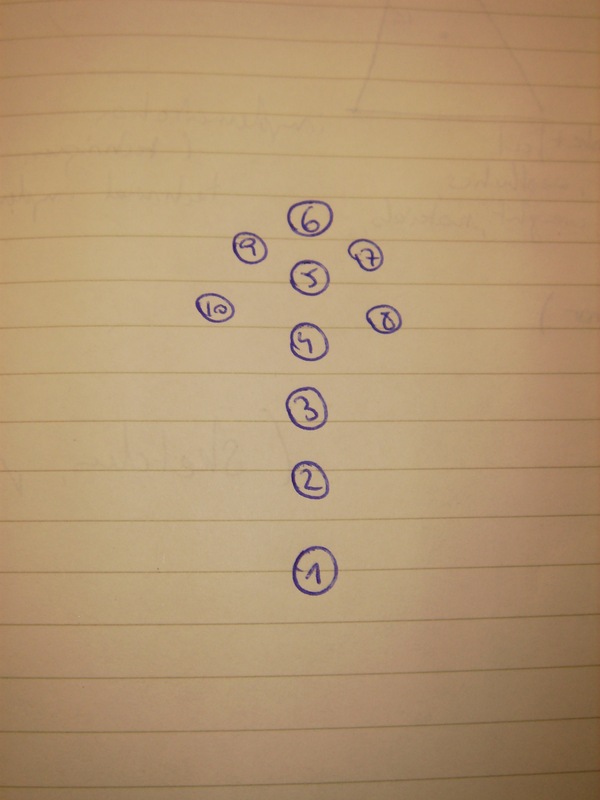 Look/Feel – noted in picture. Main thing is that it functions as both ambient lamp and ceiling clock. Since you stare at the ceiling at night not the wall so much. dual functionality means it serves 2 purposed for the parents - night light and lamp. One less thing to buy right? Implementation – chip board for main led housing and bamboo for the legs or High quality MDF or Bamboo if that's available (renewable source). See through material cloth wrapped and hot glued. Look/Feel - Very much like the lamps you can find at ikea with bamboo inner structure/ribbing. Outside wrapped in an opaque paper or cloth. shadow projects 360 around the globe. More than likely mono-color. in a room – convenient for tight spaces- like kids rooms usually. Implementation - I would probably deconstruct an ikea light and use that structure. 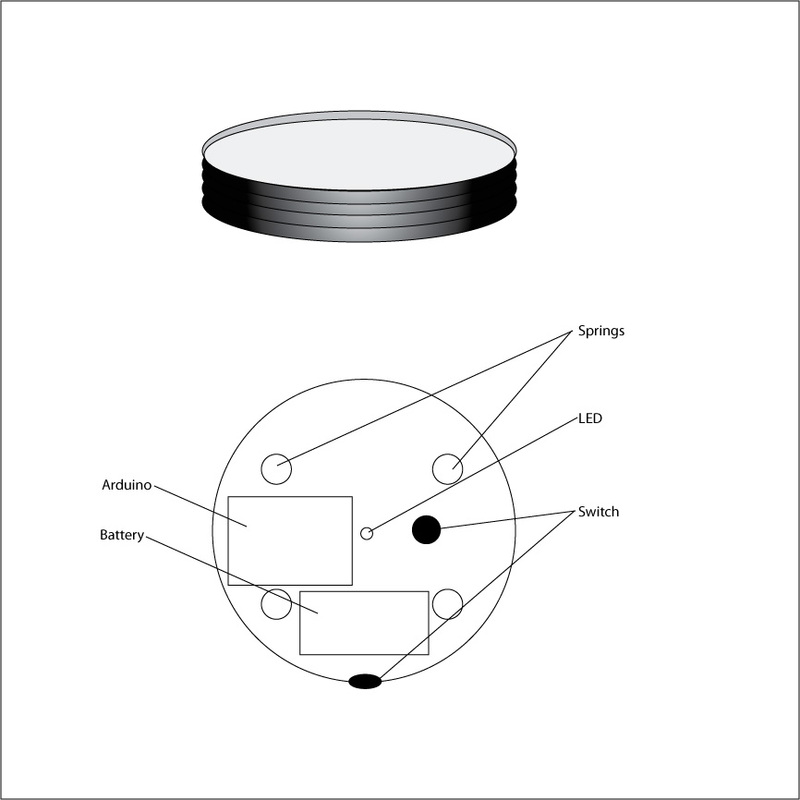 The LEDs would be placed in a pizza like 2-3 inch cylinder. I think 4-5 HIGH flux LEDs should do a good job at soft lighting. 4 & 5. Outlet cover night light with safety cover OR mid wall mount. own designs, or slide in color sheets they can buy. Another possibility is this same prototype but longer as a mid wall linear clock for those who don't really care for nightlight-in-a-socket. Role – Kids room and Hallways. You can tell what time it is when you wake up to use the restroom, midnight snack etc. As for the mid wall clock this really could be for any age. It may be better to use single color so it can go anywhere in the house, not just kids room. 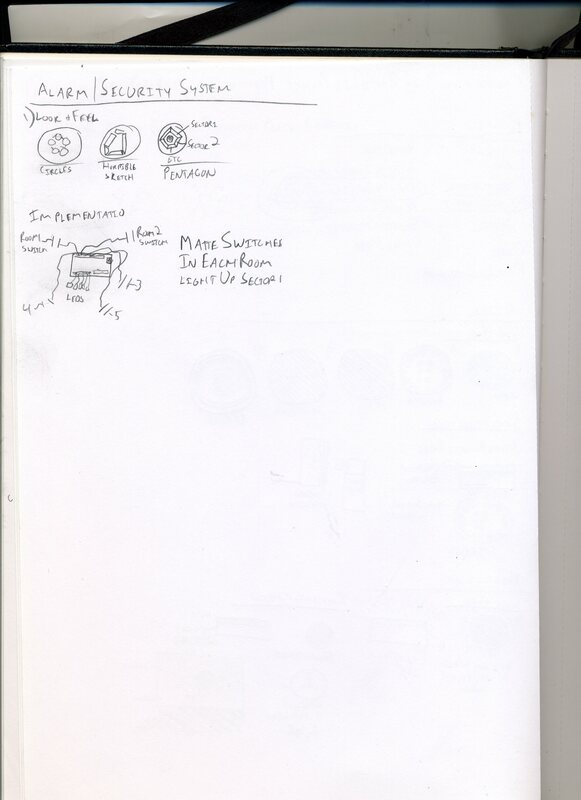 Implementation – This may be a Solid Works printed file if it is wall cover. If not I would consider using chip board and fashioning a box for this setup w/HIGH FLUX LEDs. Look/Feel – flat white front & heavy weight paper. Roughly 12 inch diameter. would not read very well in the day so this is really a bedroom application. all of the above instances. This would be their answer. fitting the arduinos in neatly, as I might need 2 units. This time around I went ahead and used a laser cutter to cut the intricate shapes. I also added all other animals to the mix and slimmed down the model (2.5″ tall). Each LED has a separate bracket inside to focus the light. I implemented 2 buttons to fade in on special characters using PWM and added an ALL on function. * USE HIGH FLUX LEDs, ~ wider spread but still direct light. solution? I don’t know yet. • the artifact is placed in a room, next to a wall, or in the center of the room, and provides ambient light, constantly while turned on. It serves the same purpose as a night light for children who are afraid of complete darkness, or to set a consistent ambience to a dark space. There is no interaction whatsoever, the “Nite Lite” is turned on, and left to create soothing mixture of colors. Because the NiteLite has a set functionality, users could purchase different colors, or the tri-color, as well as different sizes (= brightness) if they want to create different ambiences for different spaces in particular. • NiteLite comes as a single cube with only one switch, either a push on or toggle that the user interfaces with. After turning the device on, the user sits back and enjoys the visual show created by the fading of the light on or off. The light is radiating from the clear cube directly, but more interestingly the light is projected vertically on to the ceiling, or perhaps a wall if oriented horizontally. The projected light takes the form of big circles, that mix different colors of light, in various sequences. The sequences would never be the same, utilizing various random functions, so that this does not become a repetitive (= annoying) effect. • translucent acrylic box has, on one face, a lens (can also be acrylic) that focuses and aims the light from the LEDs. 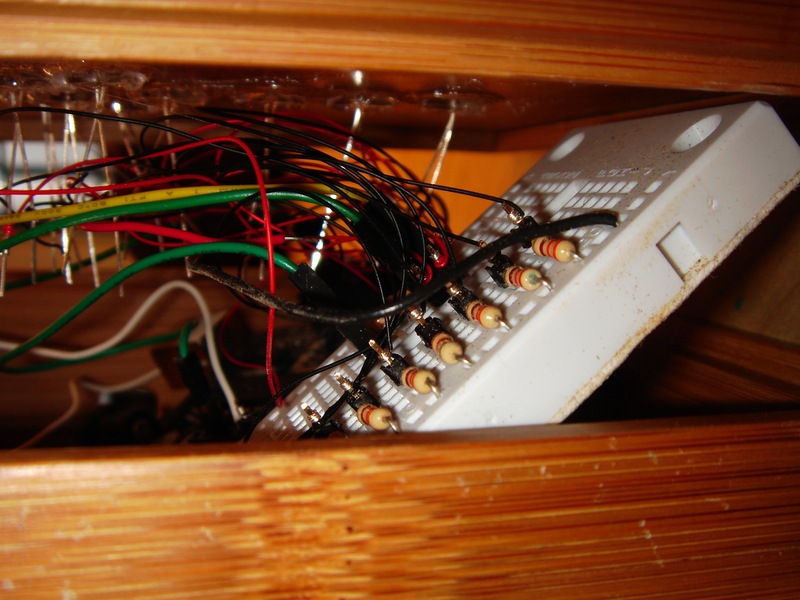 The box houses 3 LEDs (of which colors can be combined and offered in different combinations), which are powered and run by a microcontroller (a small PIC would be fine). On/off switch can be very small, so the box does not have a front or back, only a ‘bottom’ from which no light would emanate (this is where the PIC and wiring are). On/off can be push-button or a toggle, but it must be small and discreet. 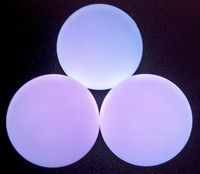 intensity of the balls glow increases and decreases with the amplitude of the music, or performance. Role B. while intensity of glow is controlled by the amplitude of sound surrounding the ball, color of the ball can be controlled/affected by the movement of the ball. Juggling the balls would yield interesting effects, but DANCING with the balls (ie, moving it along specific axis’) would yield a performative instrument. Learning curve of what direction yields what color would be very high, audience now become even more involved in a live performance setting. Look A. LiteBall will have a flat side to the sphere, enough to be able to sit on a flat surface and simply be a source of spectacle for the user. Being a static artifact for a spherical object is nice, as there are no corners, no front, no back at all. The flat side would serve as the bottom and could contain a very small switch. The pulsing light would emanate from the sphere evenly on all sides. Look B. The material should feel like a very grip-able rubber so the user can hold on to it easily, even during intense physical exercise while holding the balls. 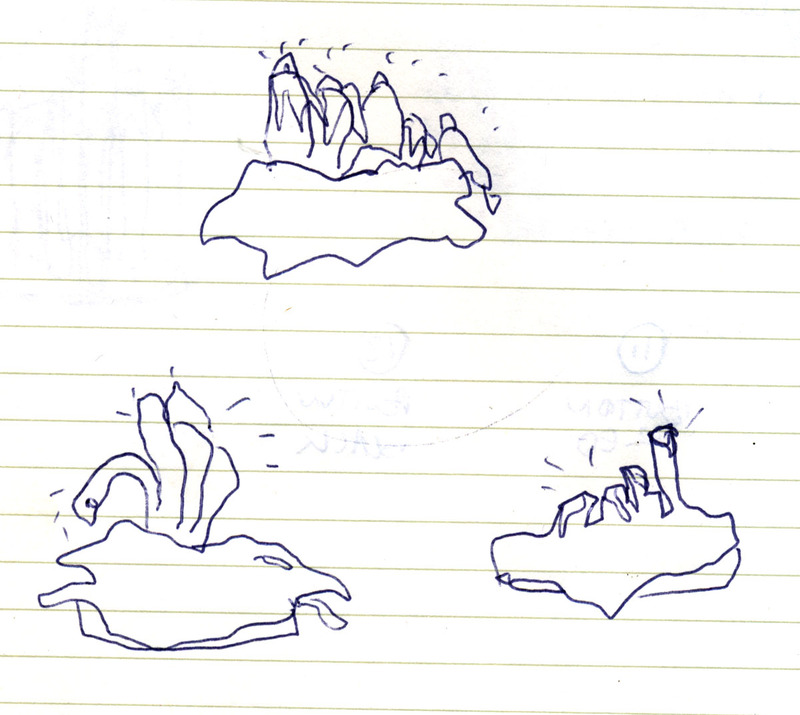 The effect would become glowing hands if the user moves them very quickly. They should have some weight to them, as if someone was juggling, a nice weight is necessary for a good experience. Implementation A. LiteBalls need to be made of a sphere of thick, translucent rubber. 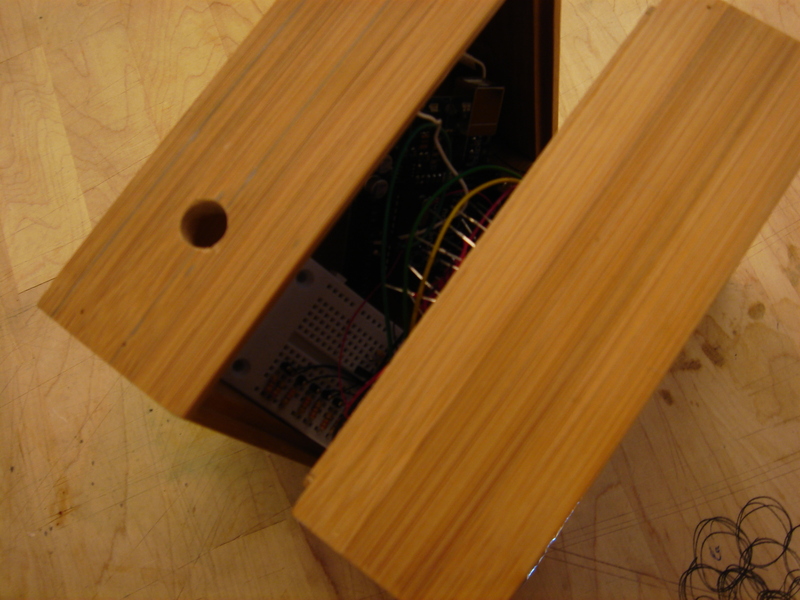 Inside, a single 360 degree tri-color LED needs to be controlled by a small microcontroller. A microphone, which can be very small would require one or two holes on opposite sides of the sphere. 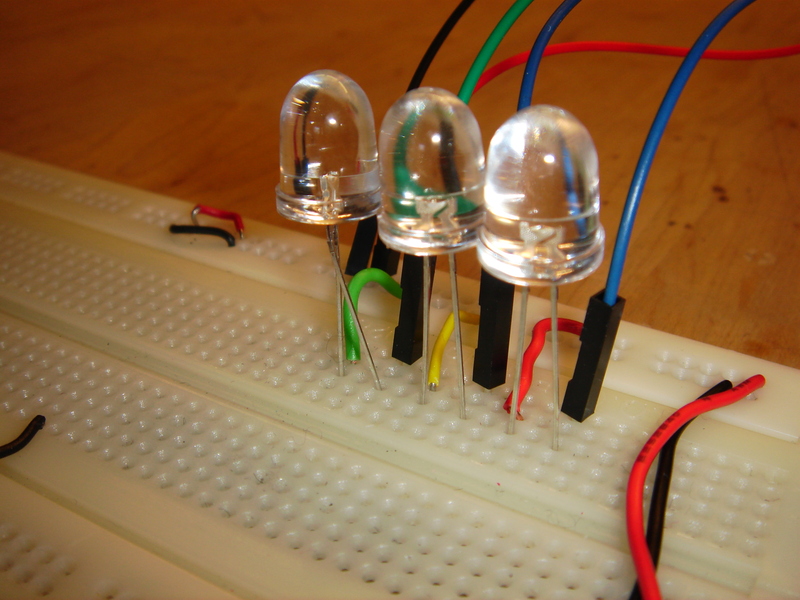 Microcontroller hears a range of amplitudes, and maps them to the PWM output for the brightness of the LED. Automatic calibration of these ranges could happen every few minutes, so that the balls are effective in a quiet living or bedroom as well as a loud concert. 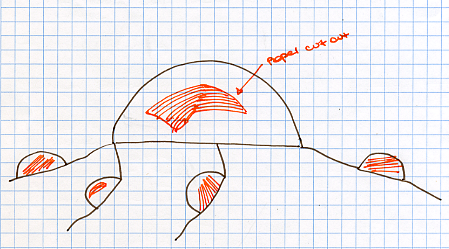 The flat side of the sphere could have a recessed switch to not interfere with juggling or dancing, but still be able to sit nicely on a flat surface, not rolling around. Implementation B. 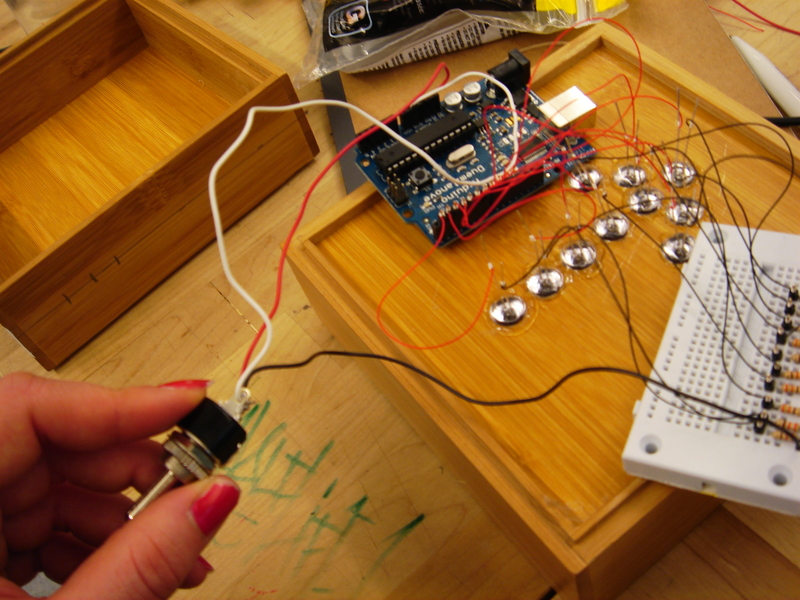 An accelerometer must be embedded in the center of the sphere, for detection of movement. Each of the three axis’ are mapped to R, B, and B, respectively. Brightness of light still controlled by amplitude of sound around the ball, but color is now controlled by movement of sphere on x, y, or z axis. • A cool hat that glows translucent colors, in patterns that the user could customize, and with LEDs placed in customizable arrangements around the headwear. So cool, kids would be wearing it anytime they go out at night. Or, perhaps you are a weary parent and are taking your toddler or elementary aged child to an outdoor event, and it gets dark. Keep track of your kid at night even in the dark by just putting this had on their head. They’ll think it looks cool, you the parent will always be able to see them! HUZZAH!